Walter Littlemoon on his family's property near Wounded Knee, S.D. Before the award-winning documentary film “The Thick Dark Fog”and the book “They Called Me Uncivilized”, there were the Lakota man’s boarding school experiences that led to both stories. Today, Walter Littlemoon shares his memories of a childhood spent in a federally-imposed school system that he tells us did everything but educate. Orange and yellow leaves paint the trees across land that’s been in Walter Littlemoon’s Lakota family for generations. It’s a quiet, peaceful place that reminds him of his childhood. But everything changed when Walter Littlemoon was 5 years old. Then, like tens of thousands of other Native American children, he was required to go to boarding school. That had been “it” for Native American children since 1879, when the first government boarding school was founded in Carlisle, Pennsylvania. It was the brain child of Captain Richard Pratt, a U.S. Army officer who said “all the Indian there is in the race should be dead. Kill the Indian in him, and save the man." That internal killing began, says Walter Littlemoon, at age 5. Instead, they were marching – everywhere they went, in a column of twos. 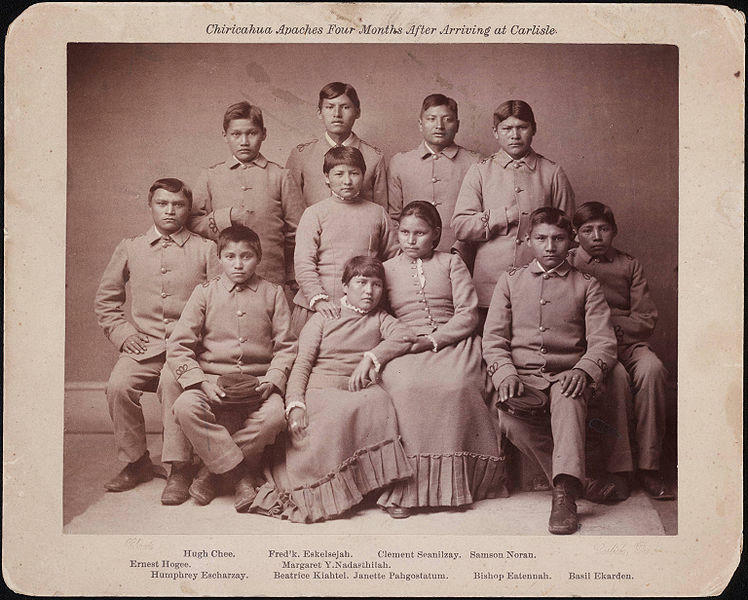 Native American children in boarding schools wore uniforms. They also had their hair cut very short –which is a violation of most traditional Native American beliefs. Littlemoon says they were also forbidden to speak their language. Littlemoon says that included a variety of punishments for everything from not shining your shoes to being overheard speaking Lakota. The children were also “disciplined” by being made to kneel on pencils. After four years of this abuse, Littlemoon ran away – for the first time. Each subsequent escape saw him picked up at home and returned to school. Once, when Littlemoon was 10, he was brought to the Pine Ridge Tribal Jail instead and locked up there. Even that, says Littlemoon, just made him learn better ways to survive. Walter Littlemoon attended two different boarding schools on the Pine Ridge Reservation. His last 2 years of education were spent at the Wounded Knee community one-room school house – which Littlemoon describes as a pleasant change from his past experiences. Even his time served on the front lines in Vietnam doesn’t bother Littlemon as much as his boarding school memories. That’s because Littlemoon has been diagnosed with “Complex Post Traumatic Stress Disorder”. The condition comes as a result of suffering abuse for months, or years, and particularly impacts children whose personalities are still forming during the abuse. Los Angeles filmmaker Jonathan Skurnik produced “The Thick Dark Fog” – which explores Littlemoon’s story and the boarding school system. Skurnik is currently in the process of creating a visual history archive of Native American boarding school survivors that would mirror the SHOAH Foundation’s Holocaust work. Skurnik says telling Native Americans to “just get past” their boarding school experiences is like telling African-Americans to forget about slavery or Jewish people to get over the Holocaust. And for Native Americans, like Walter Littlemoon, the healing process is only beginning…60 years after leaving the boarding school system.